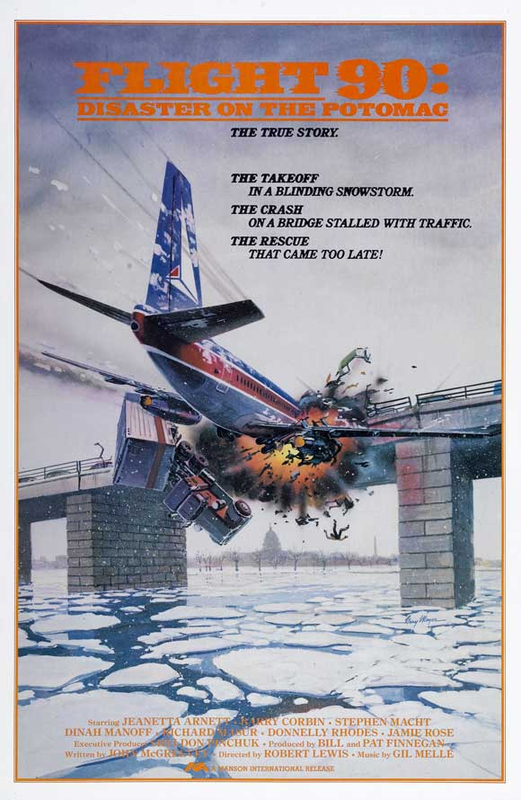 Flight 90 Disaster on the Potomac is a television movie about the tragic aircraft accident of Air Florida Flight 90 departing Washington National airport on a snowy and icy 13th January 1982. Shortly after take-off, the Boeing 737 plunged into the 14th Street bridge in Washington DC. Four passengers and one crew member survived the aircraft accident. The few survivors were rescued by the National Park Police helicopter. Four people in cars on the bridge were also killed by the aircraft collision. The movie itself is mostly focused on several of the passengers and one of the flight attendants, not so much the accident itself. It is interesting to see how all these people with varied backgrounds, at different stages of their lives, come together. It shows how heroic people can be when it comes to saving the life of a complete stranger. The movie, like many movies made for television, is a low budget production. Looking beyond the production quality, if you have an interest in aviation and flight safety, it is certainly worth watching. It reminded me one of many reasons why I enjoy working in the airline industry and not just from a flight safety perspective. You meet interesting people with incredibly diverse backgrounds when working in the airline industry. This particular accident was one of the many aircraft accidents I studied at university. There were two main contributing factors to this accident, the engine anti-icing system was not configured correctly for the cold icy conditions and an accumulation of snow and ice on the wings leading edge after deicing had taken place. Both of these factors are clearly pointed out in the movie. If you are interested in learning more about the Air Florida Aircraft Accident, you can read the official NTSB report AAR-82-08. One of my minors at university was aircraft accident investigations, which is why I enjoy learning about flight safety. The actual helicopter used by the National Park Police to rescue the accident survivors has officially been retired. It is now on display in the US National Law Enforcement Museum in Washington, D.C. The helicopter is displayed in a hovering position, for visitors to see. The entire movie of Flight 90 Disaster on the Potomac is available to watch on youtube (embedded above), however I cannot guarantee it will always be there to watch. It is one of many movies out there, if it were not for youtube, this movie would have been lost and forgotten. Hopefully this movie, like many other aviation movies, remain online for you to watch. If you do not have time to watch the entire movie, you can take a quick look at the movie trailer. If you have any questions, please feel free to contact me by e-mail or through any of the social media links listed below. Remember, learning in aviation never ends. Thank you and enjoy.. Accident, Aircraft, Aviation, Potomac. Bookmark.